London Broil is often prepared as an alternative to steak. When it is prepared properly, seasoned well and presented it is a lovely cut of meat. If overcooked it tends to be tough. 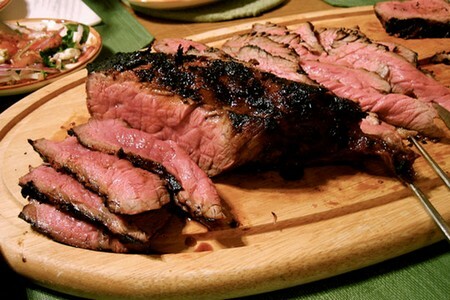 Here is a recipe on how you can prepare London Broil at your next meal. Read on for more details. Choosing the right type of London Broil is vitally important. Purchase a top round London Broil. This cut is tender. The shoulder cut is not as tender as this one. You should also inspect your top round London Broil and make sure it is evenly sized all the way around. In some cases the meat may be bigger on one side than the other. You want to have it the same size so it will cook at an even rate. Season the meat well on all sides. You may use any rub you like. Refrigerate the steak for 3 hours prior to grilling or broiling. Heat your grill or broiler. Use a non stick spray to coat the broiler pan. The broiler should be set to medium high. Put the steak on the broiler pan. Cooking time should be about 8 minutes on each side. In a total of 25 minutes the broil should be done. You should check periodically to prevent scorching the meat. Allow the meat to cool before slicing. Put the juices from the pan aside you will need it when serving the dinner guests. This helps it to retain the juices. Put it on the slicing board. Cut the meat in the opposite direction as the grain with the knife. Make thin slices to serve to the guests. Pour the juices from the pan over the plated meat. The London Broil should be served piping hot. Right after it is cut and topped, plate it up and serve it. The longer it sits, the less tender it becomes. London broil needs to be medium rare. It will appear slightly pink in the middle and browned along the perimeter. Some people consider this the proper way to prepare London Broil. You can always adjust to fit any appetite. Plate up the London Broil with a side of steamed veggies or even homemade mashed potatoes. You can also buy a pre made mushroom gravy to compliment the London Broil. You don’t have to think about making this from scratch and the flavors mesh really well. Enjoy your London Broil while it is hot! How to Keep Your Computer in Top Shape?